Silicon Valley was shocked last weekend at the sudden death of SurveyMonkey.com CEO Dave Goldberg, husband of Facebook COO Sheryl Sandberg. But the circumstances around his death might serve as a cautionary tale for millions of consumers who work out at gyms or at home. According to various media reports, Goldberg died of massive head trauma when he fell while working out on a treadmill in a hotel fitness center in Mexico. It turns out treadmills are the cause of many more accidents that don't get nearly the publicity of Goldberg's. According to the Consumer Product Safety Commission (CPSC), there were at least 10 treadmill recalls in the previous decade, mostly due to unexpected speed changes that could cause a fall. In 2008, Cybex International recalled several models of its treadmill after receiving 24 reports of unexpected speed changes. But even when these machines are operating perfectly they can be dangerous. Treadmills are powered by electric motors that turn conveyor belts. The operator either walks or runs at the speed of the belt. When an operator slips, stumbles or falls the belt keeps moving, making it even harder to recover. All treadmills are equipped with an emergency stop switch, activated by pulling a cord and removing a magnetic contact. While the device is effective, casual observations at health clubs where treadmills are in use suggest few operators attach the cord to their bodies as recommended. A 2011 report by CBS News documented a number of cases of injury, and even death, due to a treadmill mishap. The CPSC reported treadmill accidents in 2009 results in some 19,000 consumers being rushed to emergency rooms with broken bones, amputated fingers and concussions. In her advice to readers about treadmill use, About Health sports medicine expert Elizabeth Quinn writes that operating the machine safely is just as important, if not more so, than the benefits it can provide. Understand the safety features; Don't just locate the emergency off switch, test it. 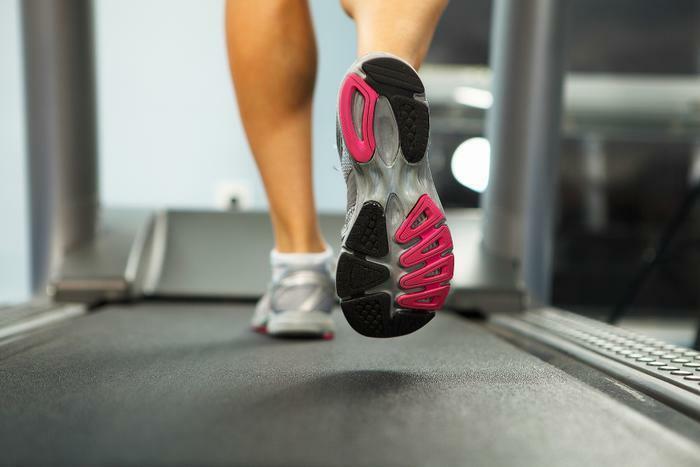 Get a handle on the speed; stand on the treadmill with your feet on the side rails before you start the machine. Increase the speed of the belt to about 2 to 3 MPH to start. Using a treadmill at home, when no one else is around, requires some extra caution on a user's part. Make sure the machine is positioned properly, away from walls, windows or mirrors that could cause injuries if you fall. If there are children in the home, make sure the treadmill can't be used as a toy when no adults are around. And when using a treadmill when no one else is present, it is doubly important that you attach the emergency stop cord to your body or clothing, so that the machine stops if you happen to fall. In fact, exercising alone -- at home or anywhere else -- isn't the greatest idea. Almost any kind of exercise equipment can be dangerous. The lowly free weight can cause serious damage if dropped and, besides the treadmill, machines like stairmasters and elliptical trainers can cause injury if you fall while using them. Sen. Harry Reid, the powerful minority leader of the U.S. Senate, suffered serious head and eye injuries when he fell off a stairmaster. And back in 1998, the governor of Florida, Lawton Chiles, died of an apparent heart attacked while using a stationary bicycle. He was alone at the time and his body was not discovered for several hours.